The night sky is a collection of mythological stories derived millennia ago. None are more vividly portrayed than Orion the Hunter squaring off with Taurus the Bull. With his shield and club draw in defensive mode, Orion seems ready for the fierce battle with an outcome we will never know. The stars that make up our hunter are some of the brightest stars seen this time of year and helps illustrates its familiar pattern. As if on purpose, the three belt stars lie close to the celestial equator and allows both hemispheres to view the mighty hunter to some extent. The belt stars are not perfectly lined up. Mintaka is found at the far right and appears a little higher. The Egyptians used this exact orientation when constructing the three famous pyramids of Giza. While still on the belt stars, be sure to check out the left star named Alnitak. With a spectral class of O9 Alnitak is a very hot star and has a surface temperature of 31,000 Kelvin which is mostly in the ultraviolet, a spectrum of light we cannot see with our eyes. Technology allows us to observe the universe in many different ways. If Earth were to orbit Alnitak, our planet would have to reside eight times farther than Pluto for life to exist. From Alnitak nudge your scope a bit east to the Flame Nebula. It is part of the Orion Molecular Cloud Complex, a vast dusty region that is plentiful in star creation. This stellar nursery should produce around 800 stars. 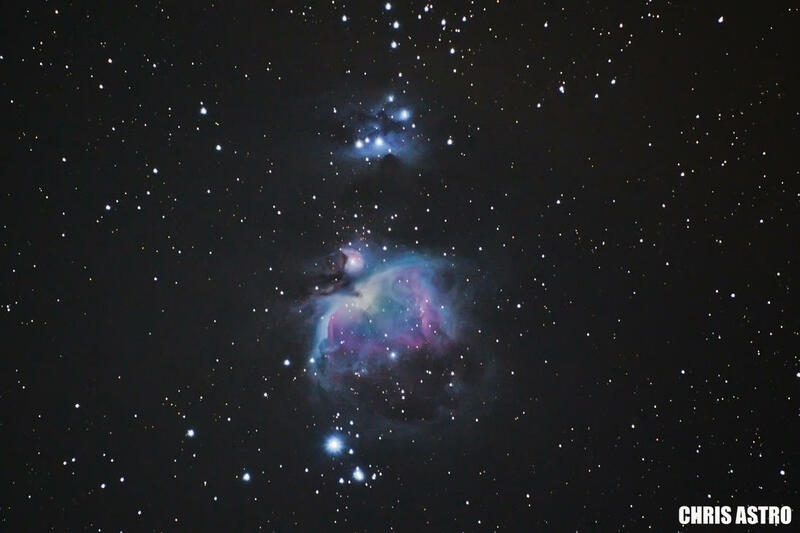 One of the most observed and photographed object is the Orion Nebula (M42). This fuzzy region located in the sword that dangles from Orion’s belt is a another star forming region located 1,500 light years away. Measuring 20 light years across, this emission nebula can be seen with the naked eye from suburban skies. Along with the great stellar cloud containing the Trapezium the four stars at the heart of M42, we have M43 at the top and looks like a great “comma”. This appearance is the result of a turbulent dark dusty lane blocking off the background light. Then we have the Running Man located at the top. Located a bit closer than M42, this is a blue reflective nebula that does not provide any light of its own but does have a beautiful open cluster close by and is lit up via near by stars. Wide angle photography captures these three in remarkable detail and colour. Now locate Orion’s left shoulder star named Betelgeuse. This super giant sun has a spectral type of M2 which is much cooler than our Sun. Betelgeuse has almost consumed its entire fuel supply and one day, in the not so distant future, will end with a grand supernova. When this star detonates, it will probably become as bright as the full moon and be seen during the day for weeks. Our Milky Way Galaxy has seen its share of violent stellar explosions from stars that resided thousands of light years from Earth. Betelgeuse is only 500 light years from us. 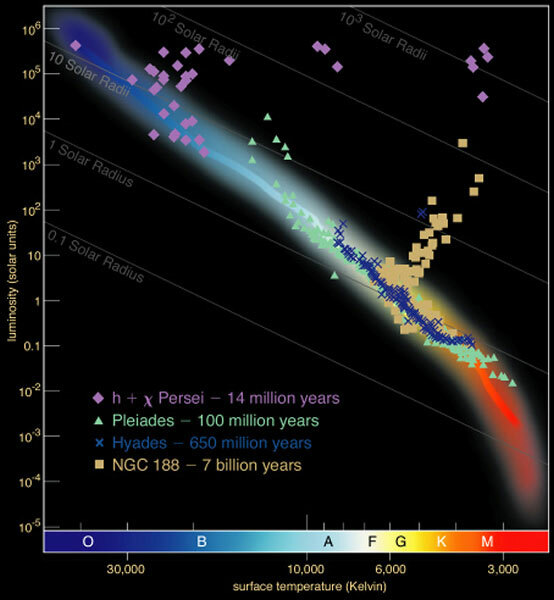 Astronomers are aware of its fate, it’s just a matter of when. From Betelgeuse move your telescope two thirds to way to the star Meissa (Orion's head) until you come upon NGC 2022. This planetary nebula is located some 8,200 light years away and consists of a double shell surrounding a burnt out star. Moderate size telescopes will pick up the stellar nucleus at the centre which is surrounded by an elliptical ring and a fainter ring beyond that. Astronomers believe the inner nucleus is still expanding at 26 km/sec with the hot star still radiating a temperature of 108,000 Kelvin. Comet Catalina has been the buzz in the astronomical community for the past couple of months. Venturing from the far depths of the Oort Cloud, Catalina came within 108 million kilometres of the Earth on January 17 and is still delivering a great show as it reseeds from us. Digital and CCD cameras have captured spectacular moments in time as Catalina will never return to our solar system. Catalina sported two distinct tails pointing in different directions. Not all comets reveal such an awe inspiring image. As comet hunter David Levy always says, “Comets are like cats: they have tails, and they do precisely what they want”. We have been extremely fortunate to have seen two naked eye comets in back to back years. You probably recall Comet Lovejoy with its perihelion (closest approach to the Earth) on January 30, 2015. Who knows when the next naked eye comet will grace our skies? We can see all five naked eye planets in the morning up to February 20 after which Mercury begins to slide back into the solar glare. Alignments such as this are a semi hot topic in the media. The usual questions I have been asked are: “what is the significance behind this alignment” or “will the gravitational pull affect the Earth”, etc. There is no scientific merit behind this gathering of the planets. It does however spark the curiosity for people to wake up a bit earlier than usual to witness this lovely morning portrait. I use the word “gathering” loosely as when all five are visible, the scene stretches across half the sky. Over the course of the night the planets rise at different times. On February 1, Jupiter rises at 8:35 p.m. local time, then Mars at 1:11 a.m., Saturn at 3:35 a.m., brilliant Venus at 5:41 a.m. and finally elusive Mercury at 5:59 a.m. The waning crescent moon will also be visible in the morning sky passing each planet. On February 2, the 37% moon will lie exactly between Mars and Saturn. In fact these five planets along with the Sun and the Moon give us the seven days of the week. Note – this article represents my tenth year writing the Sky This Month.